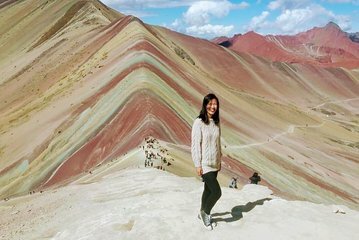 Ervaar het natuurlijke wonder van de regenboogberg van Peru tijdens deze volledige dagtour vanuit Cusco. Maak een schilderachtige wandeling van 3 hike door de veelkleurige valleien van de bergen, geniet van een spectaculair uitzicht op de Ausangate-berg en Rainbow Mountain en passeer traditionele Quechan-dorpen. Ontbijt en lunch zijn inbegrepen. This was a very beautiful hike to get to rainbow mountain. I highly recommend to go just for the hike scenery. I would even say it was more gorgeous than rainbow mountain. I wouldn’t worry about the driving as others put. Yes, there are a few scary parts but that’s what you get for going to hike up in the mountains you have to get there somehow. They should put in additional info to bring snacks and Advil. A lot of us had headaches due to the altitude and luckily another traveler had some and shared! es una experiencia inolvidable, unos paisajes hermosos!!!!! lastima del pesimo servicio. los guias muy bien pero el chofer conduce a exceso de velocidad, hablando por telefono celular, y el camino muy angosto, poniendo en peligro a todos los turistas !!!!!!! lastima. el camion muy incomodo. lastima de tan hermosos paisajes!!!!!!! The place is wonderful, but it can also become a nightmare to go up there. In the voucher they say they they will bring some oxygen, but it isn't true. I was feeling bad, I asked for some oxygen you have to reach 5,200 mt -17,000 ft, but didn't have it with them. Overall it is not very well explained in the description, it looks easy, but it is not. While the trek and experience was well worth it, please be weary of the driving! Another traveler and I witnessed the driver nodding off multiple times on the way to the hike WHILE driving. Also the driving was a bit erratic. Scariest experience was riding in the van-definitely not a professional. Worth the view and beautiful place, however, our tour guy was a con artist. Told us it would be 70 for the horse charged us 80 and then took ten sols from me because he had no change. He said he would give it to me on the way out and never did. In the tour asked us to pay for apart of the tour that was included with our package and we had to show him proof because he wanted another 10 sols each. Also on the way home dropped us in the town plaza when our tour specifically said hotel pick up and drop off. After a all day hike we needed to take an additional cab home. I was disappointed with the lack of professionalism especially when we paid good money for this tour.